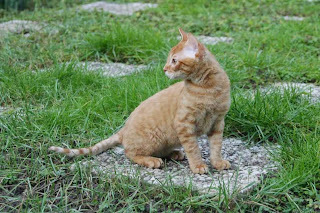 German Rex is a cat breeds of domestic cat. They are a medium sized cat, breed with slender legs of a medium length. The head is round with well developed cheeks and large, open, ears. The eyes are of medium size in colors related to the coat color. The coat is silky and short, with a tendency to curl. The whiskers also curl, though less strongly than in the Cornish Rex and they may be nearly straight. All colors of coat, including white, are allowed. The body development is heavier than the Cornish Rex - more like the European Shorthairs. A German Rex cat is very friendly and quickly makes contact with its owner. It is lively, playful and intelligent. It is the master of all acrobatic tricks, which it repeats again and again with huge enjoyment. Its temperament is much the same as a Cornish Rex. Breeders crossed the American Shorthair with the Persian in the United States around 1960. 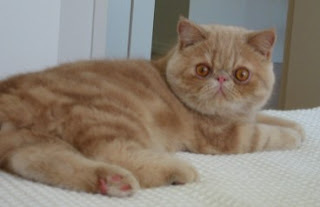 Thus were born shorthaired Persians, called Exotic Shorthairs and recognized by the C.F.A in 1966. During the breeding program, crosses were also made with the Russian Blue and the Burmese. Since 1987, the only allowable outcross cat breed is the Persian. The F.I.Fe. recognized the Exotic Shorthair in 1986. They have nearly the same body as the Persian, but a thick, dense short coat. They appeal to people who like the personality of a Persian but do not want the hassle of grooming a long-haired cat. They are also known as "The Lazy Man's Persian." The Exotic Shorthair has a compact, rounded, powerfully-built body with a short, thick "linebacker" neck. Its large round eyes, short snub nose, sweet facial expression, and small ears give it a highly neotenic appearance that some people may consider cute. Tail: Short, thick, carried low. Rounded tip.